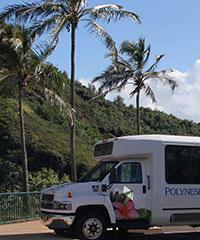 Travel Blog #093 - Taking the "Movie Tour"
Today we did something that I've wanted to do for a while, we went on the "Movie Tour" with Polynesian Adventure Tours. The movie tours' concept is simple, they have a TV screen in the bus that plays a movie they edited together. The movie contains scenes from many different movies that have been filmed on Kauai. Our driver TC stopped and started the movie between his narrations to coincide with our location throughout the tour. It was a pretty cool concept, the first place we pulled up to was the dock at Ahukini Landing. All of a sudden John Wayne came on the screen and in the backdrop of the film was the exact same lighthouse that we were looking at. "Blue Hawaii" a classic starring Elvis, was filmed at many locations we saw. Our guide, TC is a longtime resident of the islands and had some fantastic Hollywood related knowledge to share with us along the way. He has been a movie buff for a long time, no one was able to ask him a question that he couldn't answer. He pointed out the houses of different movie stars as well as some of his favorite beaches as he drove. The powerful air conditioning system in the bus kept the van cool as we moved from location to location. 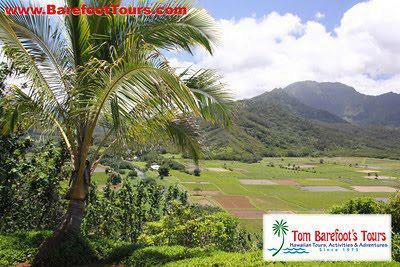 We stopped for lunch in Hanalei on the North Shore of Kauai, at the edge of the picturesque Hanalei Bay. Here TC recommended some locations to eat and shop and then let us wander on our own for about an hour. I found a local plate lunch place that TC recommended in the Ching Young Village and tried out their signature "Chili Pepper Chicken" plate lunch. It was a very large portion and was extremely delicious! After I was done with lunch, I still had some time to wander around and look in some of the surrounding stores. There was a surf store that was having a fifty percent off sale, and there was also a surf board exchange that was happening on the grass across the street that kept me occupied until it was time to get back on the bus. On the ride back we stopped at some more movie scene locations and watched a very interesting segment about the making of Jurassic Park. As we pulled up to my drop off point, I said good bye to the friends that I had made on the bus during the day as well as our guide TC. Since I went on the tour I have not been able to look at the places that we drove by in the same way. I have always been a fan of history, especially the local history of the islands. Some of my favorite books to look through over the years have been the ones that have old pictures of areas that I have been to. I love to be able to see how things were captured in a picture that I can compare to how they are now. Throughout this tour we saw many clips from older movies that did a great job documenting the changes that have occurred on Kauai. The classic Elvis film "Blue Hawaii" was filmed at many locations that we saw. To illustrate my point of what I'm saying further, there's a beach in Wailua that Elvis rode horses down in "Blue Hawaii" that I've passed many times before without even really giving it a second glance. Now I think about that beach as the Elvis beach every time I drive by. My favorite location that we passed was the Coco Palms. This historic hotel was a cornerstone in the hotel industry for over 30 years. On September 11th, 1991 the island of Kauai was hit with one of the most powerful hurricanes on record; the grounds were devastated. The historic hotel was never rebuilt and has laid in ruins ever since. This was where the scene was filmed in "Blue Hawaii" where Elvis meets some visiting girls as they're checking in to their hotel. In the movie it had manicured grounds and looked amazing. Now the hotel lies in ruins, condemned after it was torn apart by the hurricane "Aniki". To be able to witness history in this sort of way was definitively my favorite part of the trip. When I woke up this morning and looked out the window, I couldn't help but smile when I saw that it was an absolutely classic sunny Hawaiian day outside. This tour takes you on an action packed Hawaiian Hollywood odyssey, where you will explore some of the most romantic, exciting and adventurous movie locations in the world and learn about the rich history of Kauai.